AP Postal Circle Multi Tasking Staff(MTS),Post Man& Mail Guard Recruitment 2019 apply online at http://appost.in/ AP Postal Recruitment 2019 | Andhra Pradesh Postal Circle New Job Notification for Multi-Tasking Staff, Postman & Mail Guard Posts | Total 68 Job Vacancies | Apply Online Application Form @ www.appost.in | Last Date 28th Feb 2019 AP Postal Circle Recruitment 2019-For 68 Posts Of Multi Tasking Staff (MTS), Post Man& Mail Guard. 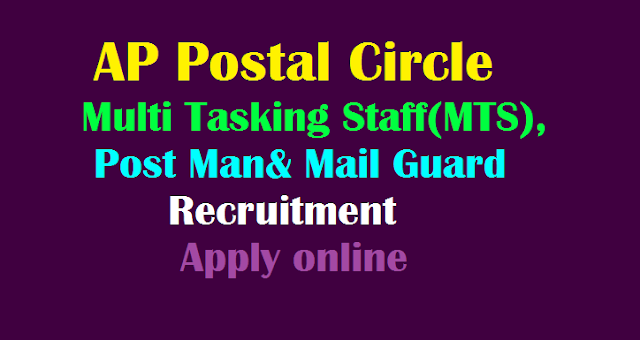 AP Postal Circle has released notification for the posts (MTS) Multi Tasking Staff,Post man& Mail Guard recruitment in 2019. Eligible candidates may apply online from 31-01-2019 to 08-03-2019. Eligibility,Educational Qualification, age limit,Exam pattern,syllabus and more details are given in this page. All aspirants should have passed in 10th standard or ITI or its equivalent examination from any recognized university/ board. AP post circle selection will be made on written examination to be held at Kurnool, Vijayawada and Visakhapatnam. Deposit your prescribed fee through any mode other than e-payment in post offices till the last date of 05.03.2019. One person should submit only one application between 31st January 2019 to 28th February 2019. Step II: Login through the Register ID and Date of birth. The selection of candidates for appointment to the posts will be made by examination. Who wish to apply for Andhra Pradesh Postal Circle Recruitment 2019 vacancies can log in/ visit their official website to collect more details like, Syllabus, Admit Cards, Results, AP Postal Upcoming Notification 2019 & etc available at http://appost.in/ .